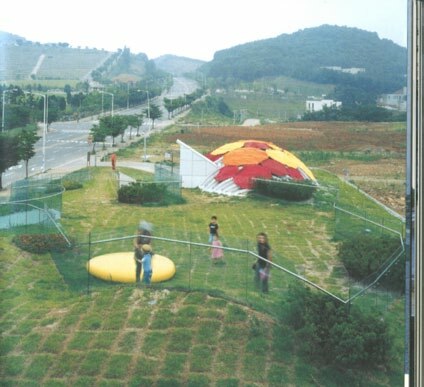 Ga.A Architects, 2004 : Dalki Theme Park, CORÉE DU SUD . 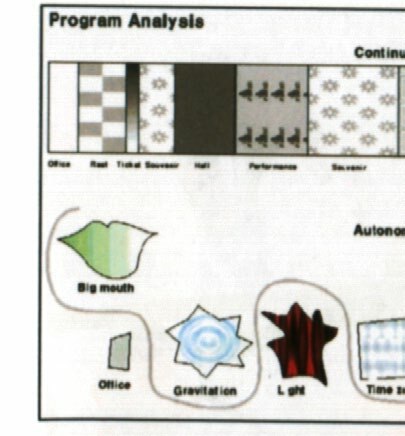 La chose la plus intéressante pour l’architecte est que il doit avoir une connaissance très large. La connaissance physique(chauffage, éclairage, ventilation, biologie, psychologie, sociologie, chimie, astronomie, musique, art, cinéma, littérature). Tout est nécessaire. Mais également bien sure les plus fondamentaux sont les sujets techniques et constructifs. 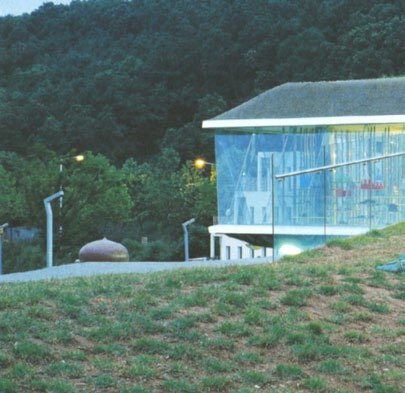 Located in HEYRI ART VALLEY, SOUTH KOREA. DALKI is a cartoon character inhabiting a garden with her friends. DALKI theme park is a place where imaginary creatures interact with human visitors in real settings. This proposes the question- where are the borders of imaginary world? The concept is “forest building“, because forest is the home for many mystical creatures as well as in literature/fantastic and reality. The experience of visitors is organized in three different levels: under the forest, inside of the forest tree mass; and under the forest. On doit explorer les liens entre l’organisation de l’espace et les manifestations d’ordre psychologique. Characters interact with visitors in a space for shopping, playing, eating, longing and exhibitions dealing with scale and nature aspects. Learned dichotomies imaginary/real, shopping/play, natural/synthetic, site/building, culture/commerce. The question is how to find middle way the compromise between this things. The forest top is created as a roof garden with natural vegetation; Inside the tree mass is located enclosed retail space with DALKI characters and a play area; Under the forest – a covered outdoor space between pilotis. The vertical stacking allows short circuits: like hypertext in HTML, users can jump from one space/program to another and to choreograph their experiences. (Also when making the project od Architecture university in quartier FIGUEROLLES we need to find compromise. Compromise between many things local inhabitants/ students, futuristic/contemporary, natural/synthetic, unobtrusive / accent). Play is everything and everything is play. It is through play that children begin to understand the world and society. Is it possible to create a promiscuous zone with no boundaries between commercial, recreational and pedagogical activities? Can this coexist with a more traditional understanding of program areas and functions, to allow somebody to enter, buy something, and leave? All the strategy helps to blur the boundaries between public space, shopping space, interior and exterior, natural and artificial. What could be a commercial box is transformed into a structure open to everyone- young or old, right or not. That’s created by doubled open space for public use and interior commercial level sandwiched between them. Main structure is from concrete. Plus concrete beams and columns in ground floor. Glass facades. But most interesting thing from the constructive aspect is the roof, because it is not only usable (utilisée), but also covered with grass and accessible for the publics. 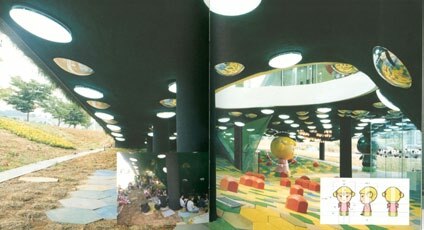 Ga.A Architects, 2005 : I like Dalki!, in VERB CONDITIONNING ARCHITECTURE BOOGAZINE, Editions ACTAR, BARCELONE, p176.-192, p192-205.